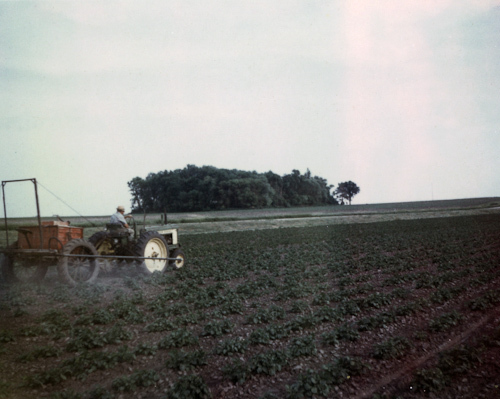 This is a photo of my grandfather taken around 1980 of him spraying potatos with “something” probably a fungicide or pesticide to keep the plants from being eaten. My grandfather, Andy Pfeiffer, farmed the bottom of a dried up lake located North of Windom, MN. It was very fertile peat dirt. So fertile infact, my mother talks about it actually catching fire when she was young. The dirt was quite dry and due to the amount of organic material, it would catch fire and actually smolder. If you wanted the fire out, you needed to cultivate to mix the soil. 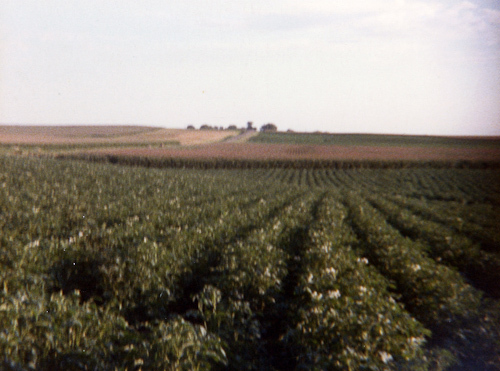 My grandfather grew about 20-25 acres of potatoes. In September they were ready to be dug. This he did with the same tractor and an antique potato digger which was basically a spade on wheels with a web belt that would bounce the potatos and knock the dirt off as they tumbled off the back of the machine. It looked like total chaos when harvest came. The field would be full of cars and people as folks came with the whole family and made an event out of picking their potatoes. There were always people following very close to the digger and picking potatoes off of it or trying to have them fall into their buckets. My grandfather would stop and politely or sometimes less politely tell them to stand clear. The last thing he wanted was someone getting a hand caught in the webbing of the digger. But people don’t think of that happening and how bad that would be, they are just trying to fill their sack quickly and get the choice potatoes before someone else does. 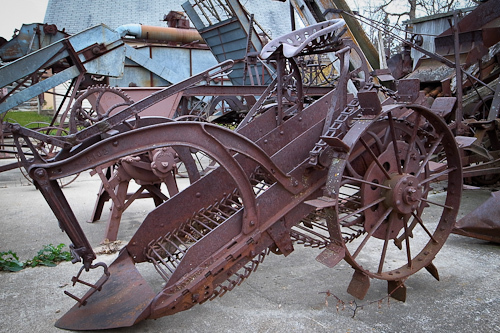 Folks would follow the digger through the field and gather up potatoes into 100lb gunny sacks. There were several people my grandfather hired that would come and sew your gunny sack with twine and help you load it into your car. The hundred pound sacks were sold for $2.50 – $7.50 depending on the potato market that year. He farmed into the late 1980’s before retiring. This entry was posted in Uncategorized and tagged andy pfeiffer, copyright ryan ware, family farm, john deere, mn, potato, potato digger, potato digging, potato farming, potato spraying, potatoes, windom, windom mn. Bookmark the permalink.